The Magic Seed, The Genie Out of the Bottle, The Invisible Man, Temple Raiders, The Lost Alien, Cowboy Bheem A ferocious tiger who is actually a man who is cursed, enters Dholakpur and starts creating havoc there. 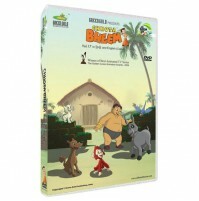 Watch Bheem fight the tiger bravely and save Dholakpur. Also watch Bheem teach the -talking Tree- a lesson by flashing his true image in front of everyone. Do not miss the fun!